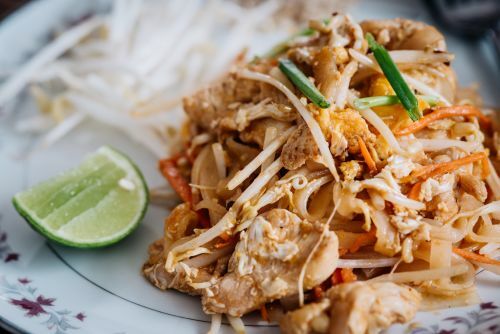 Kinn Thai Knox uses their own specialised couriers to deliver their food. Deep fried net roll, filled with crab meat and aromatic Thai herbs served with plum sauce. Crispy skin soft tofu with Kinn’s secret recipe sauce topped by crushed roasted peanuts and chilli flake. Thai- style sweet corn fritter with sweet chilli dipping sauce. Crispy puff pastry stuffed with mixed vegetable served with sweet chilli sauce. Skewers of marinated Char-grilled chicken tenderloin served with cucumber relish and peanut sauce. Pan-seared sea scallop with chilli lime sauce. Roasted duck breast, cucumber and shallot wrapped in house made rosemary pancake. 24 hrs Slow cooked lamb shank in a massaman curry with mash sweet potato & roti. Stir-fried crispy pork with garlic, chilli and Chinese broccoli. Crispy soft shell crab with homemade chilli jam sauce. Crispy pork belly, Vietnamese mint with capsicum chilli sauce and cucumber relish. Stir fried crispy pork with chilli, kiffir lime jam and green bean. Spicy stir-fried of seafood, green peppercorn, kachai, kaffir lime leaves, chilli and turmeric. Sizzling marinated wagyu beef, onion, capsicum, shallot in garlic and black pepper sauce. Choice of sauce - Wok tossed with sweet soy sauce and Thai herb. 3 flavour sauce crispy barramundi. Tender roasted duck with bok choy & plum sauce. A rich red curry of roasted duck with pineapple, lychee, cheery tomato and basil. Light curry. bean pumpkin, eggplant and Thai basil. Thai curry-flavored with green chilli paste, bean, bamboo shoot, apple eggplant, kaffir lime leaves and Thai basil. Slow-braised beef cooked in massaman curry and potato. Stir fried oyster sauce, garlic and vegetables. Stir fried peanut sauce (4/7: Turmeric/curry powder) and vegetables. Stir fried mild chilli jam, roasted cashew nuts, onion, shallots and long red chilli. Stir-fried Thai spicy sauce, garlic, chilli, onion, bean and Thai basil. Fresh Asian green vegetables stir-fried, tofu, garlic with vegetarian sauce. Stir fried grill eggplant, vegetable with spicy chilli basil green peppercorn sauce. Stir fried pumpkin, tofu, egg, vegetable with oyster mushroom sauce. Baby cos lettuce, mix Thai herbs, sesame dressing and crispy oyster mushroom on top. Traditional Thai stir fried thin rice noodles with egg, bean sprouts and crushed peanut. Stir-fried thick rice noodles with vegetables, egg and sweet soy sauce. Spicy and aromatic stir-fried flat rice noodles with fresh chilli, egg and Thai basil. Thai fried rice with egg topped with crumbed prawns. Thai fried rice with egg topped with marinated chicken skewers and peanut sauce. Chicken fried rice onion, Chinese broccoli egg and seasoning. Thai style prawn fried rice with shrimp paste, egg , onion, Chinese broccoli and seasoning. Poached chicken and prawn, betel leaves, tossed coconut stripe, fried shallot, cashew nut Thai herbs, coconut milk dressing. Grilled Waygu beef, ground roasted rice, shallot, coriander, basil & chilli lime dressing. Seared slow-cooked salmon, nashi pear, Thai herbs with chilli tamarind dressing. Marinated char-grilled chicken thigh fillet with Thai herbs and spices served with Asian salad. Char grilled Wagyu wok tossed mix vegetable. Grilled pork ribs, basted in Kinn’s secret recipe sauce. An aromatic crispy chicken mid-wings with fried Thai herbs. Bangkok style spicy soup with prawns, oyster mushrooms, lemongrass, galangal and lime leaves. Wok-tossed deep fried squid with onion, ginger, chilli and coriander. A salad of shredded green papaya with lime juice, roasted peanuts, green beans and tomatoes served with crispy soft shell crab.